After a great deal of investigation, I recently purchased a treadmill desk for use with my computer. The decision-making process was more difficult than I expected for many reasons, especially the substantial cost of the equipment I eventually chose. I found a lot of information on the Internet, but much of it, though interesting, was not helpful. Articles discussed the health benefits of walking while computing, how long it took to adjust to walking while working, how to choose a treadmill for runners, how to build a stationary desk adapted to a runner’s treadmill, or how to convince a boss to allow a treadmill desk in the workplace. Nothing I found discussed the information I want to share with you, now that I have several weeks of experience with my equipment: how to decide what kind of treadmill and desk are right for your particular situation. My circumstances likely differ from yours, but the many factors I had to examine will give you clues as to what you need to take into consideration. From the day I was born, I’ve rarely moved a muscle unless forced to do so. Now that I’ve turned 70, aching joints make me all too aware of my sedentary past. My doctor recently gave me a stern warning: “Susan, your bone density numbers are going in the wrong direction.” She urged me to add strength and weight training to my weekly yoga, tai chi and Feldenkrais classes. Yes, I take calcium and vitamin D supplements and I reluctantly do a daily one-mile walk, but this regimen has proved insufficient to improve my osteopenia. My response was to groan, “After doing all that and flossing my teeth, there will be no time left for anything else.” I want to spend my time in my jewelry studio or on my computer, not exercising. Knowing myself only too well, I decided that I must multitask—exercise while I do other things. Making jewelry doesn’t provide many chances for movement of the larger muscles but the several hours a day I spend on the computer do—if I walk while I read or write. I concluded that I must buy a treadmill desk. What sort of treadmill and what sort of desk? When I started my research, I immediately found articles and videos touting Dr. James Levine of the Mayo Clinic and the Steelcase treadmill desk. I loved the idea—a desk that moves up and down electrically, plus a specially engineered treadmill with no handrails, designed to work well at low speeds. But I was shocked by the price, $4,799 plus $150 for installation, not something I could easily afford. And what if I spent all that money and then didn’t use the equipment? Surely I could get a treadmill desk for less money than the Steelcase version. I remembered a treadmill I’d seen gathering dust at a friend’s house. She offered it to me for $150, but I would have to pay $100 or more for a couple of strong guys with a truck. Perhaps there were other drawbacks to that treadmill. Certainly, it was out of warranty. Would a good lubrication bring it back to ideal condition and, if so, how much noise would it make in operation? How long would it last? At best, it was a treadmill for a runner, that is, one built to operate for short periods of time at relatively high speeds, not built to function for many hours each day at low speeds. Should I build a desk? Many of them already owned treadmills, so they had no concerns about what equipment to buy, how to get it into their homes, or where to put it. Of course they would want to build desks for those treadmills, regardless of the pros and cons of such a setup. Other writers worked for companies that equipped their employees with treadmill desks. Again, they were probably spared any decision-making about their equipment. Few, if any, bloggers seemed to care about the aesthetics of their treadmill desks, some of which were, to put it bluntly, quite ugly. Every visitor to my house would see my treadmill desk, which would not be hidden in a bedroom or garage. Attractiveness is a characteristic I value—I am, as I mentioned, a jewelry designer. Many websites showed desks that sit directly on the arms of treadmills. I wondered whether such a desk would vibrate when in use. And would it be the right height for me? The majority of the owners showing off their homemade desks were handy or mentioned partners who built their desks. I would probably have to hire someone, an additional cost. Some of the desk plans were somewhat complicated. Wood or other supplies cost money, so I would not want to experiment with designs or heights. Perhaps most significant, the writers and bloggers all looked at least 30 to 40 years younger than I. This may account for why many seemed rather unconcerned about the ergonomics of their desks. I realized that, if my desk were not the right height—and what, exactly, would be the right height?—my wrists, neck and shoulders could cause me pain. In that case, I likely would not want to use the treadmill desk. I concluded that building my own desk might not be the best idea for my circumstances. I had seen a website for the TrekDesk, a purpose-made desk that fits over most treadmill arms. One can manually adjust it from 46.5″ to 56.5″, so I would be able to experiment to find the right height. I could buy the TrekDesk on Amazon for $479 with free shipping. Together with my friend’s treadmill, the price (now totaling $729) would still be a lot lower than buying the Steelcase product. Yes, but . . . surely I would want to sit down sometimes while using my computer. For one thing, I like to read my email during breakfast. (Don’t worry. My keyboard has a tightly fitting skin. [Search for <keyboard cover Apple iMac wireless bluetooth keyboard>on eBay. One company, imicros, sells it for $3.19. The tight skin fits the MacBook, but I easily cut it to fit my wireless keyboard.]) I’ve since discovered that eating a meal or drinking a cup of coffee is not easy to do while walking on a treadmill. The TrekDesk is 72″ wide, with a cutout section in the center for the treadmill. The distance from the front of the cutout to the back of the desk is 18″, a little skimpy for my Cinema Display and keyboard. The two height-adjustable support legs are fixed in position, 49″ apart. Thus, while the desk surface seems wide enough for both a chair and a treadmill, in fact, there is room for the treadmill but not for my chair (an Aeron, which my back loves). Regardless, I could not work at a table 46.5″ high while seated, even if the 11.5″ space on either side of the cutout would give me sufficient room. A closer reading of the Trekdesk’s specifications told me that it adjusts to “perfect ergonomic settings” for those 5′ 4″ to 6′ 4″ tall. I’m 5′ 2″. That settled that. Now what? What about two desks side by side? What about two small stationary desks, a high one above the treadmill and another beside it to use with a chair? Perhaps, but I absolutely love the screen real estate that the Cinema Display gives me and do not want to give that up. The desk would need to be fairly deep to accommodate the display and the keyboard, and I worried about using the display on a possibly unsteady surface above the treadmill. Could I move the Cinema Display back and forth? Yes, but it’s somewhat heavy, at just under 19 pounds. I doubted I would happily move that weight each time I wanted to change position. And I would probably have to move my MacBook as well, because the cable for the Cinema Display is rather short. Shifting from sitting to walking on the treadmill and back would require quite an effort. If I were to use my laptop while on the treadmill and the Cinema Display only when seated, I reasoned that I would be tempted to work seated. These solutions seemed far from ideal and two displays with their associated cabling was definitely an economically unjustifiable proposition. Would a GeekDesk serve my needs? I thought the Steelcase desk would be perfect, so I wondered whether there was anything similar available at a lower price. Searching the Internet, I found the electrically operated GeekDesk. Depending upon the version, the GeekDesk rises from a low of 21″ or 23″ to a high of 48″ or 49″ and anywhere in between, a range that accommodates someone my size. There are several combinations of frames and desktops ranging in price from $749 to $985. The more expensive versions have displays that indicate the height of the desk as it moves, and there are four handy programmable height settings. But wait! Why do the videos and all the illustrations show people using the desk only either seated or standing? Could it be that the legs of the frame are not far enough apart to accommodate both a chair and a treadmill? I found no information on the website about the distance between the legs, so I emailed the company and discovered that the legs are a maximum of 50 7/8″ apart, not quite wide enough. The photographs do not clearly show that there are 14″ on each side of the legs on even the largest desktop. 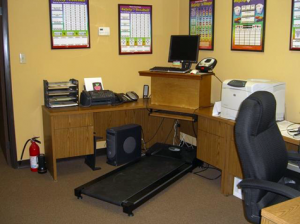 The desk cannot be used for a treadmill and a chair side by side because of those inset legs. That was disappointing, because the GeekDesks are handsome pieces of furniture. The GeekDesk staffer sent a link to a photograph of the company’s desk with a treadmill but no chair. She also informed me that the company is “working on possible treadmill options but [we] do not have any specifics at this time.” Whether this statement means that the legs of a new version will be further apart, or that the company is simply considering offering treadmills is not clear. Relax The Back’s good looking and even more expensive desks proved to have the same disadvantages. What about standing while using a height-adjustable desk? I dismissed the idea of using a standing desk very quickly. First, although standing is a weight-bearing exercise, it is not as beneficial as walking. Second, for me at least, standing for a long time is too hard on my back and legs (although I do now stand at the computer sometimes for a little break from walking). It was time to consider a purpose-built treadmill and electrically adjustable desk. Other than Steelcase, I found two companies producing treadmills and electric desks that I thought would fill the bill. I examined the Signature Sit2Stand treadmill desk very carefully. It was difficult to compare Signature’s equipment to the treadmill and desk that I eventually bought because the specifications as described on the two websites are not exactly comparable; Signature did not provide quite as much information. It is possible that the Signature desk would have proved entirely suitable, but I did not choose it for several reasons. First, the base has extremely thick, heavy-looking legs that I did not find attractive. Second, the desk is 67″ wide; I doubted there would really be enough room for my Aeron chair, considering how hefty those legs are. Even the wider (72″) Executive version has those very thick legs and, in any case, it costs $3290, much more than I wanted to pay. (The Grande Executive version [80″ wide] costs $3455.) The finish that I would have chosen would have added another $24 to $135, depending upon the version of the desk. Without actually trying it out, it is difficult to know whether Signature’s purpose-built treadmill is better than the one I ended up buying. In any case, differences in quality may not show up for several years. Signature offers a “standard” treadmill that is included in the cost of the treadmill desk and an upgraded version for an additional $390. The belt on the standard treadmill is only 16″ wide versus the 18″ of the upgrade and the warranties are one versus five years. There are other differences between the two Signature treadmills, but what concerned me most was that both treadmills have a top speed of 10 miles per hour. This feature and the fact that manual inclines are possible might attract those who want to run on their treadmills, but I expected just to walk on mine at low speeds. Although the company maintains that its treadmill is “engineered to maintain its strength for long-term use,” I worried that a treadmill built to operate at that high a speed might not function well for long periods of time at about 2 mph. That concern was the third reason that I chose the competitor’s treadmill desk. I continued to study the websites of the two companies that offer both treadmills and electric adjustable desks, Signature Sit2Stand and TreadDesk, and emailed questions. Both companies were responsive, but Jerry Carr, the owner and CEO of TreadDesk, was especially patient and sent very full answers describing his equipment and reassuring me over my delivery concerns. Other than Steelcase, Signature and TreadDesk were the only companies I found that currently offer treadmills without handrails. Steelcase does not sell its treadmill without the desk, but the other two companies do. I considered purchasing the upgraded Signature treadmill and the TreadDesk desk, but decided against that idea for the reasons I mentioned above, and because TreadDesk offers a lower price for a package deal. Convinced that a treadmill with an electric desk was the right solution for me but still reluctant to spend $2,795.50, I nevertheless plunked down my credit card and ordered the TreadDesk on May 5, 2011. I had quite a lot of time to ponder my decision because the treadmill was out of stock. Jerry explained that the Japanese tsunami had resulted in a lack of container space throughout Asia. While I waited, I saw my ophthalmologist and got a new prescription. I figured I might need to see more clearly while reading and walking at the same time. I also replaced my worn cross trainers. As it turns out, while the new shoes are comfortable on long walks, I prefer my Birkenstocks on the treadmill; there must be a considerable difference in my gait. I have a small folding bookcase that is exactly the right size to go between the treadmill and the wall. On it, I placed the control unit for the treadmill, a power strip for most of the electrical cords, an additional USB hub, my iPhone charger, my Time Machine external drive, and miscellaneous bits and pieces. Despite that extra storage space, I’m grateful for the size of my desk, 72″ by 32″. The treadmill dimensions are 58″ x 24″ x 4.5″ and the belt measures 18″ x 48″, which is sufficient for walking. The machine seems substantial, and has a good warranty. The low sound level is not annoying to me, or to my husband, who generally sits about 12 feet from my desk. We continue to enjoy our classical music on the radio while we work. When I am just reading, I can walk on the treadmill without using my hands, except to scroll. But if I am using the keyboard, my hands and wrists are on the surface of the desk most of the time, and they quickly get quite hot and sticky. The ceiling fan and light fixture are above my chair, not above the treadmill, so they are not sufficient for my comfort. I added a small Vornado Flippi, which is perfect because I can direct the airflow downward. I also added a small lamp because there is less light on the treadmill side of my desk. In future, I might experiment with speech recognition software. 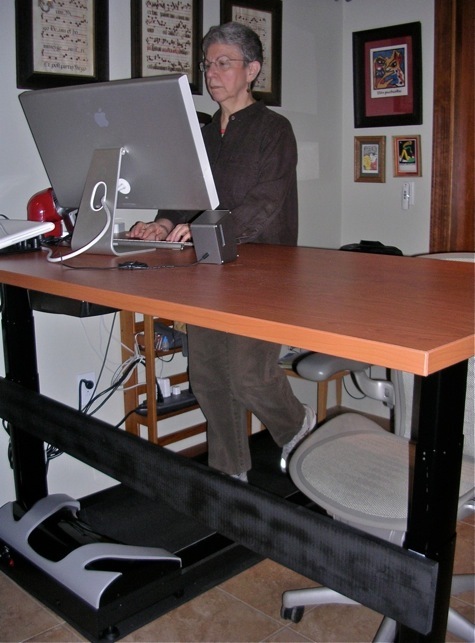 When I am using the keyboard, I keep the desk about 39″ above the treadmill and about 43.5″ above the floor (higher than shown in the photograph). This height allows an ergonomically correct straight line from my elbow through my forearms and hands. I thought the GeekDesk’s feature of preset positions was very desirable but I find it easy to adjust the desk to the best height, especially since I moved the height adjustment push button pad closer to the treadmill. (I should have informed the company that I would install the treadmill on the right side of the desk; there is a door in the way on the left.) Also, to my surprise, I want a change in height from time to time when I am just reading on my screen; the variation gives my body a little break. The speedy, smooth, and quiet electrical height adjustment is one of the best features of the entire setup; it is almost certainly the main reason that I use the treadmill as much as I do. So now you’re wondering: How much does she use the treadmill? How many miles has she walked? Well, I can’t answer those questions accurately. I decided right from the beginning that I would not obsessionally keep records. Also, I pull the plug on both my computer and the treadmill desk during Tucson, Arizona’s frequent summer electrical storms, so I lose the mileage totals on the control panel. My aim is just to use the treadmill as much as I can. At first, my bursitis bothered me a lot, so I took regular rests. (Was that bursitis due to too much sitting?) Now, I find it easy and pleasant to use the treadmill most of the time but I do many other things besides work at the computer. My speed has increased—I walk at 2 mph almost all the time while writing and 2.5 mph while reading. Perhaps I will walk even faster in the future. Yesterday’s total on the treadmill was in excess of 9 miles but, admittedly, I don’t reach that level every day. And what about my health? Other treadmill desk users report that they lost a lot of weight quite quickly, reduced their blood pressure readings, increased their energy levels, etc. I can’t really boast any of those results yet, but I feel well. The next bone scan may tell the tale. Sitting, they say, is the new smoking, even for those who are fit and exercise daily. Walking is a weight-bearing exercise but it is not the strength and weight training that my doctor insists upon. What I hope is that using the treadmill desk will increase my energy and strengthen me sufficiently to make the training I must add to my regimen bearable. For someone who hates exercising, I’m very pleased with what my treadmill desk has allowed me to accomplish so far. What value can one put on good health? It’s priceless, isn’t it? Great article. I’ve had a TreadDesk for two years now and can’t imagine ever sitting at my desk all day ever again. Thank you, Susan, for the well-written and informative article. Although I ended up buying a Precor 9.33 treadmill, your article was the starting point for my serious investigation and played a real role in my eventual decision to setup a treadmill work area. Thanks for your contribution.